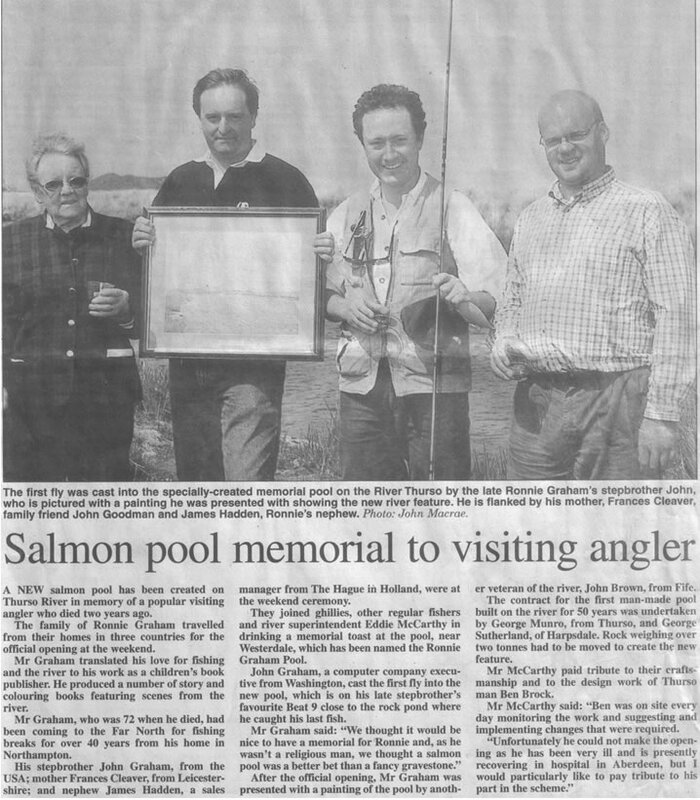 "A new salmon pool has been created on the Thurso River, in memory of a popular visiting angler who died two years ago. The family of Ronnie Graham travelled from their homes in three countries to officially open the new haunt. Mr Graham translated his love for fishing and the river to his work as a children's book publisher. He produced a number of story and colouring books featuring scenes from the river. Mr Graham, who was 72 when he died had been visiting the far north for fishing breaks for more than 40 years from his home in Northampton. His step-brother John Graham, from the US, mother Francis Cleaver, from Leicestershire, and nephew James Haddon, from Holland, were at the weekend ceremony. They joined the ghillies, other regular fishers and river superintendent Eddie McCarthy in drinking a toast to the pool, near Westerdale, named in Ronnie's honour. John Graham, computer company executive from Washington, cast the first fly into the pool, which is on his late step-brother's favourite beat 9 and near where he caught his last fish. Mr. Graham said: "We thought it would be nice to have a memorial for Ronnie and, as he wasn't a religious man, we thought a salmon pool was a better bet than a fancy grave-stone." First manmade pool built on the River for 50 years was built by George Munro from Thurso, and George Sutherland, from Harpsdale. Mr. McCarthy yesterday paid tribute to their craftsmanship and to the design work of Thurso man Ben Brock. Mr. McCarthy said: "Unfortunately Ben could not make the opening as he is very ill in hospital, but I would like to pay tribute to his part in the scheme. It was a very challenging job and which rock weighing over two tonnes had to be moved."